5.1 Japanese and English Dolby Digital soundtracks. Textless opening and closing songs. With all the players heading back to Kanna the final battle for the fate of both the village and farmers everywhere within the Empire begins. This involves a titanic battle as the Capital, actually an old airship left over from the great war and still potently armed, draws near to Kanna village. It should come as no great surprise that the samurai prevail at great cost with many falling in battle. But for me this is where the wheels completely fall off - we go from a subtle story examining the causes and motivations of various classes of people into complete anime overload bombast. Large explosions, samurai flying through the air performing impossible feats with their swords and a pantomime villian in the new emperor who plots and schemes right to the end. It is just such a huge mis-step in a series that for the most part kept the tendancy to excess in control. Especially as we never really do understand exactly what the new Emperor thinks he is doing - yes we do get that he hates the farmers, the nobuseri, the samurai and the merchants equally but we never get to see what he plans to replace them all with. In the end he stays a cypher doing villany because that is what the plot requires - if this had been kept in keeping with the film it is based on them we would see his point understanding both what he is trying to and where he intends things to go. It is something of a trend for many Gonzo series that they know how to start and they can present cool visuals but when it gets down to finishing the story in a satisfying way precious few of their series that I have seen manage it. Last Exile needed work on it's ending, Hellsing similarly started well but never really capitalised on it, Afro Samurai benefited from being a short series so never out lived its welcome even as its ending was lacking and I think Yukikaze is the only one I know that has a solid ending but is targetted for a niche audience. I still have yet to see Origin : Spirits of the Past and Gankutsuou, both of which are sitting on my desk awaiting some free time, so maybe I might be able to cite a Gonzo series that is solid the whole way through. I think what breaks my heart the most here is that this series was so very very close. 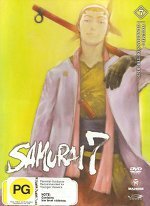 The first five volumes took the story of Seven Samurai and shifted it into an odd dystopian future that somehow worked well. This fusion of old and new gave the story a vibrance of the unexpected even as it told this well known tale. 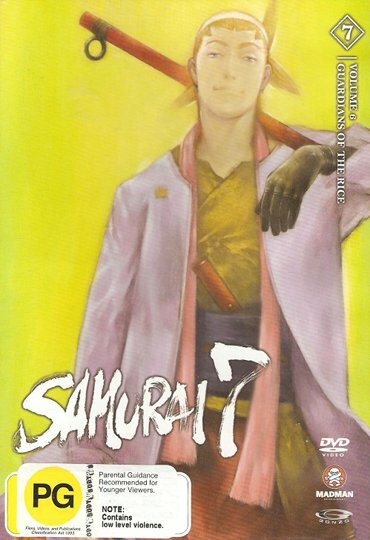 It is when it deviates away into the machinations at the empire level that the new writers seem to have deeply missed the point of Seven Samurai which was as much an inditement of Samurai even as it lauded them. But crucially to the original film motivation was everything in informing why people made the choices they did. Sadly the new series doesn't manage that, at least to my satisfaction. Given the amount of effort put into the series to have it end in such an unsatisfying way it is doubly sad. So much of it works so well that I have to suggest that people watch the first five volumes and ignore the last two. That way you get to see the strengths of the series without the disappointing ending souring the experience.